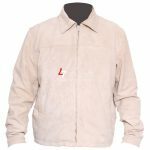 This classic jacket is made from finest cow hide and has been aniline dyed to give it a total natural look. The jacket has been washed and then hand waxed to produce a rich two tone colour. 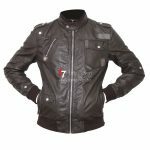 Featuring a standalone buckle fastening collar lined with wool, there are two inside pockets one zipped and one open. There are four front pockets with snap button and zip details. There are snap buttoned wrist cuffs and shoulder epaulettes.